I have a new sewing machine in my life, which I’ve only just oiled and begun to learn. It’s a Necchi Esperia that my grandma found at a resale shop and hurried me in to see. As if either of us actually thought I’d get out of there empty handed! My grandma has quite the eye–she just surprised me with a Pfaff 130 a few weeks ago. She’s amazing. She’s also the person who taught me how to sew my first wild drunken looking seam on her Touch and Sew. She has a way of being able to thread vintage machines by feel when I’ve been staring at the thread diagram for five minutes and still can’t get it right. Did I mention she’s amazing? I was trying to limit my obsessing to slant shank Singers, but after the Pfaff and the Necchi, it’s all over. I want every metal bodied Necchi I see. The 50s design period of sewing machines (and patterns and just about every other damn thing in manufacture) seem to be my favorite design era of all the major sewing manufacturers. What can I say? I’m a mid century modern girl. I had no idea Sophia Loren was the Necchi spokesmodel for a time, either, but somehow, it makes me want to shove my A-cups in a pushup bra and little black dress and sew it up in proper glam fashion. So the Esperia is a straight stitch only machine. It’s a simple bodied, olive colored machine, and so far it seems to be in really good condition. It was in a cabinet and seems to have been cared for well. I read that the Necchis, due to the tight fit of the well designed, quiet running parts, need more oil than many other machines. Fine by me. The smell of sewing machine oil gives me a deep seated sensory satisfaction that borders on perverse. I had to shake my head and laugh at the manual–it is a snapshot of the cultural prejudices of the time. It congratulates the Madam on her recent purchase and advises her not to use olive oil on her new machine (!) because it gums up the parts. I can imagine that line being spoken condescendingly by some sleazy salesman on Mad Men. It seems that finding supplementary material for this particular machine, or any Necchi, for that matter, is more difficult than information on some of the Singers I’ve been dragging home. But I found a link that has a few manuals and other ephemera here. (Bless you, sir or madam, for sharing!) There are free pdfs of a BU Mira and BU Nova manual, as well as a service manual. This isn’t mine (borrowed from an ebay listing) but looks like the very same model. Mine came with Greist parts and a buttonholer, which is a bit confusing. 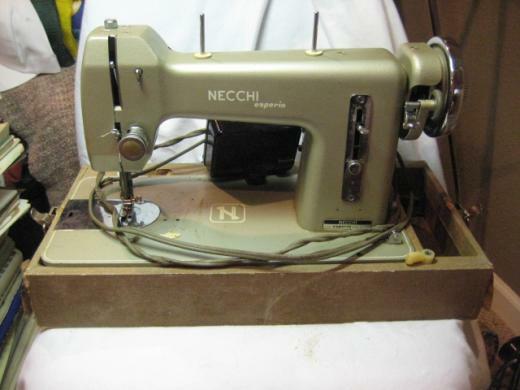 I would assume they’re not original, but who knows–I’ve seen listings for Greist accessories labeled Necchi/Elna Sewing Circle, so maybe there was some collaborating I’m not aware of. Next Post Necchi BU restoration.